Two full kitchens with dishwasher, microwave, stove, oven, refrigerator, and all neccessary pots, pans & utensils. Lakeside cabin perfect for family reunions! Who says you have to give up your creature comforts on a Minnesota vacation?! A stay in Oak Lodge at Wildwood Resort means that you get to enjoy all the comforts of home while relaxing lakeside on beautiful Bass Lake. 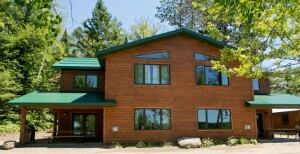 Oak Lodge is one of four new, lakeside cabins built in 2014. Constructed as a duplex unit, Oak Lodge is a two-story, six bedroom cabin. An adjoining door opens to combine two private three bedroom cabins featuring fireplace, knotty pine interior and an “Up North” decor that ensures a cozy, northwoods feel. Air-conditioning provides cool comfort during the hot days of summer while the gas fireplace offers comforting warmth on cold winter nights. On the main floor of Oak Lodge there are two large living areas complete with cable TV/DVD, fireplace and a front row view of Bass Lake (note all the lakeside windows!). The kitchens are fully equipped with dishwashers, microwaves, stoves, ovens, refrigerators, and all the accompanying dishes, pots, pans and utensils. The dining rooms each seat 8 comfortably at rustic, barn wood tables. The main floor also has two full bathrooms with tub and shower as well as two bedrooms each with one king-size bed. Upstairs on each side of the unit there are two more bedrooms (each with a king bed), a second living area and a second full bathroom with tub and shower. The extra sitting areas each have two futons which will allow the cabin to comfortably sleep as many as 16 people. Oak Lodge has a wonderful covered patio on each side of the unit with lawn chairs, gas barbeque grill, picnic table and two campfire ring. We provide your bed linens so you need only bring your own bath and kitchen towels, clothes, food and personal items; then leave the rest to us! The Oak Lodge can be rented as two private three bedroom cabins: Red Oak Lodge and White Oak Lodge. Each side will be a private cabin with all outdoor space separate from the other side of the duplex. There is extensive sound-proofing between the units to ensure a quiet and comfortable stay without disruption from the adjoining unit. Minnesota Law Requires Life Jackets – one Life Jacket per person must be on board at all times. One throw-able floatation device is also required on all boats 16′ or bigger. Renters are financially responsible for any damage caused to motors or watercraft.